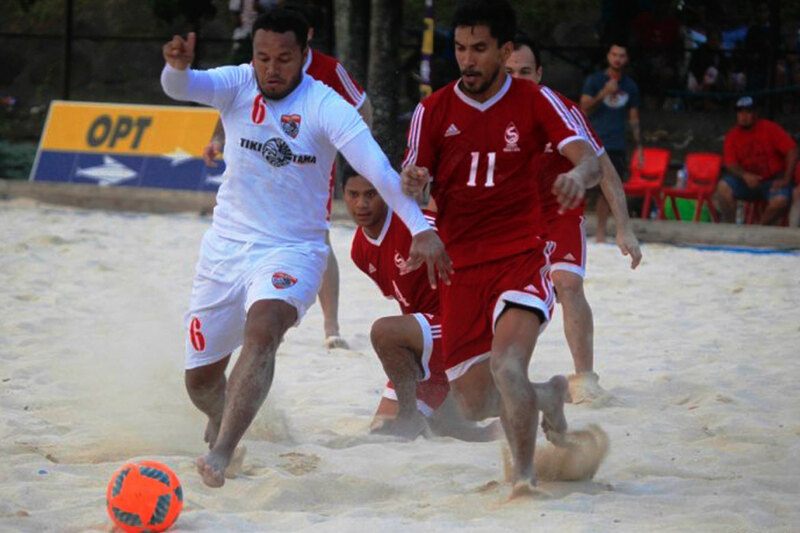 Victory for Tiki Tama sees them claim their second Beach Soccer Tour title in-a-row. An 8-4 victory over Mataiea in the final of the OPT Beach Soccer Tour has helped the Tiki Tama of Pirae secure their second consecutive title. The side, led by beach soccer national team captain Naea Bennett, were up by just one goal at the end of the first period as Teva Zaveroni’s Mataiea side managed the attacks from the Tiki Tama with aplomb. In the second period an impressive acrobatic effort from Teraii Labaste, a speciality of the Tiki Toa mainstay, had the keeper well beaten and taking his side to a 2-0 lead. Labaste soon had his second when he put a free kick in the back of the net. A fourth goal was a team effort before Ariihau Teriitau found the net to give the Tiki Tama a decent 5-0 lead going into the third and final period. Zaveroni, who has been a leader in the realm of beach soccer in Tahiti, led the comeback for his side, kicking off the build-up for Mataiea’s opening goal which was headed by his brother Heimoana Zaveroni. Patrick Tepa of the Tiki Tama soon countered however, pressing the keeper before striking. Tunui Pihaatae, who has previously joined the national team in camp in Switzerland, was next on the board scoring a superb goal to bring the score to 7-2. But another overhead effort from Labaste soon extended that lead for the Tiki Tama once more. Teva Zaveroni kept up the pressure, with a somersault of his own taking Mataiea to three goals. Zaveroni had a goal denied, but hit straight back with a lob over the keeper to give his side their fourth goal. The Beach Soccer Tour was played out over five weeks with 16 teams taking part in the competition, including four women’s teams. In the Third-Place Playoff, Green Warriors beat Air Tahiti to claim a podium finish. In the women’s competition Tereone, the team from Papara coached by Angela Taiarui – the sister of 2015 Golden Ball winner Heimanu – were crowned champions. The match finished with a 6-6 draw, before Tereone triumphed 3-0 in the penalty shootout.